Gaming on a laptop has always had a performance-related downside: mobile GPUs simply aren't as powerful as their desktop counterparts. You may have the upside of a portable and versatile machine, but you often won't be able to crank the graphics settings up as high as those who choose to play on a fixed system. Alienware thinks they have a solution to this. It's called the Graphics Amplifier, a compact enough box with a full desktop graphics card and power supply inside. Plug Alienware's latest gaming laptop into the Amplifier, and suddenly you have a system that's gaming with desktop-class power. The idea is to combine the portability of a standard laptop with the gaming power of a desktop. The Amplifier will stay on your desk as you travel with your laptop from place to place, and when you get back home for a gaming session, you power up the Amplifier and gain access to serious GPU performance. Plug in a keyboard and mouse to the USB ports on the Amplifier and you've basically got yourself a gaming desktop. Unfortunately the Graphics Amplifier won't work with every laptop out there; in fact it only works with one, the new Alienware 13. This is because the cable from the Amplifier is a proprietary mix of USB and PCI Express, requiring a special port on Alienware's latest laptop. Although only this laptop is supported for now, Alienware says that their future models will also come with the necessary port. 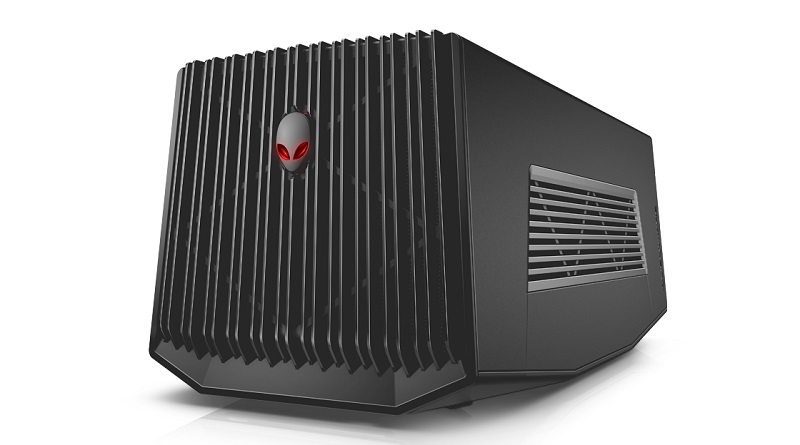 The Graphics Amplifier will go on sale today, alongside the Alienware 13, for $299. No graphics card is included, though the Amplifier supports any desktop GPU with a TDP up to 375W.